An overlay of important keyboard features geared toward students who are visually impaired. 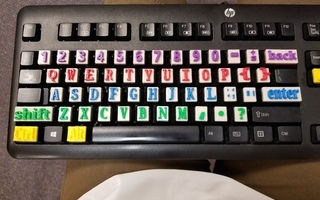 This tactile keyboard enlarges letters to more than 200% of their original size on a standard keyboard, and can be color coded. Students will use their problem solving skills and knowledge of the Engineering Design Process to create a device that saves and returns Eggbert Egg to the safety zone. 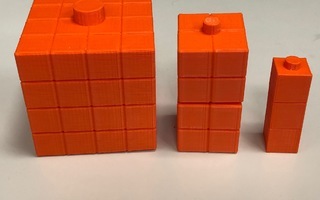 Students learn about the representation of numbers and the abstraction of different numbering systems through the use of 3D printed objects. Don't see a project you want for your class? You are not alone! Create your own Educational Project or Lesson Plan. Upload and share with the Educator Community. Five months ago Basha Elementary purchased two MakerBot 3D printers. We began with specialty projects to build student interest. In February, third and fourth grade students were invited to join the Creative Filament 3D Printing Club. This year, the focus was to master the workflow of Thingiverse and the MakerBot software as well as create and print original designs. Our aspirations for 2018-2019 are to offer an Intro to Printing and an Advanced CAD Concepts Club. The MakerBot Certification coursework was an incredibly valuable resource as students printed their design models in our first year. The built in system of support made it an enjoyable learning experience for myself, and working alongside of students during these first few months has been so insightful! Help forge the future of 3D printing in the classroom. to join the MakerBot Educators Program! Check out Mineways - an awesome free, open-source program for exporting Minecraft models for 3D printing or rendering. Watch this hour long webinar with in-depth Q&A to learn about 5 free 3D Design programs that can be used by students of all levels. The definitive guide to 3D printing in the classroom. This guidebook includes a crash course on 3D printing and 3D design for educators, 9 classroom-ready 3D printing lesson plans, and more.